American Eagle is marketed by Federal as their premium range and training ammo, and has a great reputation for reliability and consistency. Like all Federal ammo, American Eagle is made in Minnesota, right here in the US. The brass, the bullets and the primers are all made in the same facility, which helps maintain a high standard of quality control. The ammo we shot for this review is a 9mm, 124 grain. 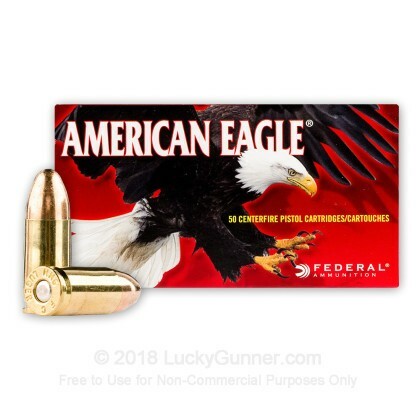 All American Eagle ammo has a full metal jacket bullet and a reloadable brass case. We did some rapid fire drills, some shooting on the move, we shot out in the rain. The American Eagle ammo didn't have any problems in any of the test guns. It was consistent and accurate, just as advertised by Federal. 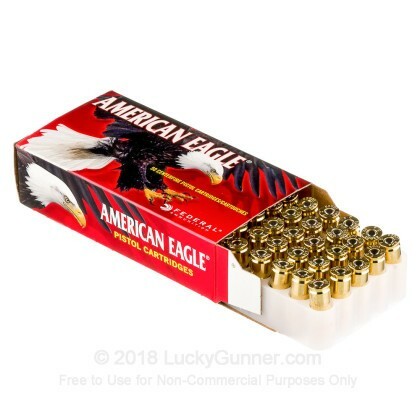 Because of its reliability and its reputation, American Eagle is a brand of ammo I wouldn't hesitate to use in competition, or any other range application where I absolutely have to be sure it's going to work every time, and perform just as expected. Great product, great value, shipped quick! Will purchase again. I think it’s the best place to purchase ammunition! Lucky Gunner all the way! I highly recommend this ammo. Works perfectly every time. And the best part is Lucky Gunner sales. 5 stars to Federal America Eagle and 5 stars to Lucky Gunner. I've never had an issue with these Federal American Eagle 124g FMJ rounds. I would highly recommend them to anyone looking for a reliable, accurate round. Also, LuckyGunner is very quick with shipping! Extremely great ammo. High quality ammo for practice, IDPA matches, and steel challenge. At 9:50 AM today (Monday) I received an email acknowledgement for an order (1000 rounds Federal American Eagle 9mm FMJ 124 grain). At 11:52 AM today I received a second email telling me the order was shipped, with delivery scheduled for Wednesday. That's a two hour order-to-ship turnaround and two day delivery (YMMV depending on location, of course). No matter how you slice it, that is *fast*! Oh, and the price and ammo aren't too shabby either. Kudos, LG! No matter which one of my guns I'm shooting, I use Federal AE for all target practice purposes. I've gone through about 1200 rounds without a single misfire or issue. The ammo is also relatively clean compared to more available and standardized ammo you find at various ranges. This is my go-to range and training ammo. Federal name and quality at an affordable price. I could buy and use cheaper 115 grain rounds, but I prefer to train with the same power I use in defensive rounds. I could buy and use cheaper brands - my Sig Sauer P320 eats everything - but Lucky Gunner makes getting the better stuff a no-brainer. Top shelf in my opinion fantastic I've put 3000 rounds through my p320 and my clock 19 not one problem one of the best brands. Lucky Gunner is the best. Bought many rounds of many calibers from lg. Always fast delivery and best prices. Won't buy anywhere else. Works perfect in my glock 43! No malfunctions after hundreds of rounds. This is really fine ammo for practice. Well made, reliable, and a very reasonable price. Add to that Lucky Gunner's usual great customer service and you have a winning combination. Great ammo! No problems at all. I have had no issues or concerns with this ammo. Lucky Gunner prices are very competitive. Great ammo, super fast shipping!!! Shot only about 500 rounds but so far no problems. Shipped quickly, order received as expected. So far has ammunition has worked flawlessly. As with other ammunition I have purchased from LG, it was shipped quickly and I received exactly what I ordered. Haven't used FAE ammunition in 9mm before, but so far, putting it through 2 different pistols, SIG P226 and P938, it has performed flawlessly through 400 rounds. Will purchase again as the price was right. Great product and superb customer service. 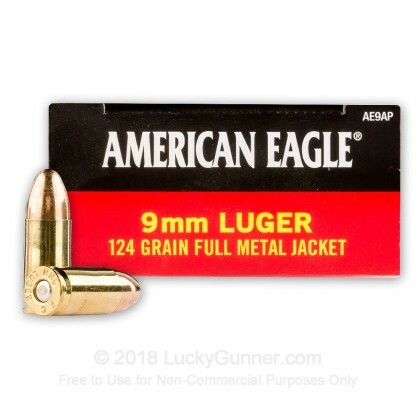 I only buy American Eagle ammo and only from Lucky Gunner. Someone actually called me from LG when I accidentally entered wrong information while ordering to make sure it was actually me placing the order. Thank you LG staff!! I've run thousands of these rounds through my G17 and can still count total duds on 2 hands. Excellent product just wish i could catch them on sale again. 1000 round - Not 1 problem!!! Ran a 1000 rounds through my new H&K VP9 and didn't have a single issue. Delivered in 2 days once ordered. Service is the best!!! No misfires. delivered on time, will buy here again and again. Delivered in good shape. Ammo works well for target practice. Like the 124 grain weight for practice, as I carry 135 grain for personal protection. Reasonable price for 1000 rounds in today's market. Federal makes a decent load. Will purchase again. I have fired 150 rounds so far with no problems, I was very happy with my order Luck Gunner prepared my order quick and with care. I will be using Lucky Gunner for all my ammo needs. Orders are all always correct and arrive in a reasonable time. This was my second order of ammo from LG. Everything met my expectations! Keep making more ammo. They are a great value and have good accuracy. They work flawlessly in my Glock 19 and 26. I just put 250 rounds through my XDm 4.5 9MM. I was surprised how clean these rounds fired. Cleaning my weapon only took minutes. Good pop and very consistent. Cheaper than the Speer Lawman 124 grain, and just as good. Not a bad buy for the money. Great brand name ammo, great prices, great service, fast delivery! What else could anyone want! You guys are the best! I would usually shoot a 115gr bullet but I wanted a heavier weight to control the accuracy, this product worked flawlessly. I ran 400rds through my S&W 9mm without a single hiccup. I would highly recommend this product! Ammunition arrived well-packaged and in good condition. American Eagle/Federal is very clean-burning and reliable. Never a dud or a failure to eject or feed. Great ammo at the best prices on the web. My new first choice for purchases. I no longer shop anywhere else. Timely shipping and delivery. I have only heard good things about this American Eagle ammo, and now I see that those good things were true. Customer support at Lucky Gunner was/has been/is great. Delivered about as quickly as I could have imagined. What is there to say...They are "Federal American Eagle" AMMO!!! This is the second purchase I've made of 1000 rounds of Federal American Eagle 124 FMJ from Lucky Gunner. I love it. It performs great I run it through my Barretta PX4 Storm and Smith & Wesson M&P Shield and haven't ever had an issue. This is my go to ammo for the range. I purchased this ammo at the request of the firearm's manufacturer (Ed Brown) for best performance. I have had no issues, the ammo shoots clean, and the accuracy is great. I am very pleased with the purchase. Good price, prompt delivery, packaged well, quality product. My first purchase with LG. Very happy. I have had nothing but 5 star experiences from Lucky Gunner! Best price and service on the net!! Purchased 1000 of these bad boys a couple weeks ago and already shot 800 of them. Only had one issue and I contribute that to my 33round mag for my Glock 17. It seemed like the spring was weak toward the end of the mag to cause it to FTF. But after 800 in all my other mags I had not one issue. I will say one thing about this ammo though is that it does dirty your gun up a little bit. After about 100 rounds the end of the gun has that grey dust to it. Other than that it's amazing! Just bought another 1000 of the 115grain. Lucky gunner is by far the best site to purchase ammo! Fast and reliable! Won't buy from any other site! This is my go-to ammo for range training with my Sig P226. I'm through about 2.5 cases of it so far and have never had any major issues. I'm not a clean vs. dirty ammo guy but for what it's worth, this seems as dirty as anything else I've shot (or as clean). This is my first order with Lucky Gunner, but certainly not my last. You have an excellent selection of products at competitive prices. The shipping was ultra fast. I placed my order at 11:00 am on Thursday and it was delivered at 9:00 am on Friday. It's always satisfying to buy a good quality American product from a exceptional American company. Keep up the good work. I have been shooting American Eagle for 10 years and have tried many others. AE is by far the cleanest and most consistent full power target ammo I have found. Just bought another case. Great range ammo, American made!!! I've ran quite a bit of this ammo through both my Glock 19 and my M&P Performance Center Shield. I will say without hesitation that this is some of the most dependable and consistent range ammo I have used. No FTL or FTE issues. I'd rather buy American made ammo and I will keep buying it for its value, performance, and reliability. 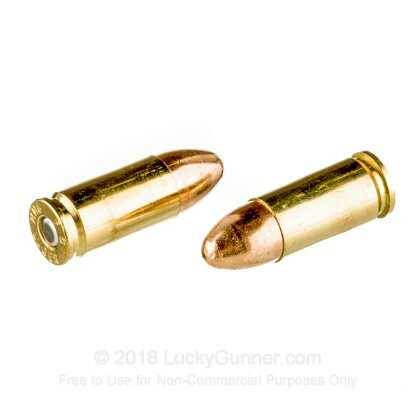 Great prices here on Lucky Gunner.com! I have a Glock 34 Gen4, brand new. It stovepipes on this ammo all the time. On Winchester, both 115 gr and 124 gr (white box) -- no stovepiping. To be fair, my Glock 26 is just fine with this one. These is excellent target ammo, there is no denying that! Great price point, no FTE or FTF as of yet (400 rounds thus far). The ONLY thing I don't like about this ammo is that it is more 'slippery' than the other ammo I use (Blazer Brass, which is also excellent). When I'm loading them up in my mags they are harder to control than the Blazer Brass, but it's not a deal breaker. If it's between this and Blazer Brass I'll go with whichever is cheaper. First purchase of American Eagle 124 grain. I normally shoot 115 grain AE for practice but since I use 124 grain defensive ammo I thought it might be a better choice for training. Good ammo, accurate, and cheaper than shooting my 124 gr. defensive ammo for practice. I am unaware what you mean by this. A couple years ago the best buy anywhere was 23¢ per round. Your sale for 21¢ was a bargain I couldn't resist. In my 88th year your purchased rounds produced a one inch grouping at 30 feet. Not much carbon in my Sig m11 A1, or my CZ 75B. I trusted the Lord Jesus Christ for salvation in 1952. The apostle Peter was armed, so am I. Your ammo shipping cannot be equaled anywhere. Many thanks. I like the quality & price of American Eagle ammo and Hickok45 endorses it! As always, Lucky Gunner ships fast. Love 'em! I bought 1000 rounds near end of Dec 2015. No failures whatsoever, excellent quality in my Sig M11, P226, Glock 19 & 26, and my Beretta M9A1. Very good price, and delivery within 2 days. Went through 300 rounds of this today with the family, no issues at all. Great Value! Of course ordering and delivery was flawless and smooth. Will do business again! As a new Glock owner, I love this ammo. No miss fires, and just as good as higher priced ammo I have used and it's made in America. I have purchased 2000 rounds of this and run them through 4 different 9mm models. Not one failure. Shoots clean. Very accurate for range ammunition. Will be ordering from LuckyGunner again and again. Great service. Last order arrived in 3 days from the day I ordered. Completely impressed. I've never had a bad experience with LG. The products such as Federal's American Eagle brand is superior. "GREAT PRODUCT" no problems at all. No misfires, all chambered without any problems. Any accuracy problems were the shooters mistake. Very clean ammo. Accuracy is a little to be desired but for the price its not bad at all. Good, reasonably priced practice ammunition with less than 1 misfire per 100 rounds. Awesome Ammo, very accurate and very clean.. I've used many brands/types of ammunition in my Sigs over the years, currently have put about 600 rounds through my P320. Federal American Eagle, 124 gr FMJ, has given consistently good results; no misfeeds, never a failure to fire, no problems of any sort. Lower priced products have never appealed to me; why tamper with success? Highly recommended. Great quality with a very good price, overall a very good value. Excellent service! I like this ammo a lot. I prefer the 124 over the 115 and use this almost exclusively at the range. Lucky Gunner's price was good and they delivered fast. I use this ammo in all of my 9mm handguns for range and training work. Very good quality and reliable. Using this ammo for practice and local competitions. Works fine and appears to be accurate enough. Always good service from Lucky Gunner. This is the only range ammo my H&K P30 has seen. Not one failure to load, fire, or eject. Shoots reasonably clean, with good accuracy. Also like the fact that it's a USA made product. Can't say enough good things about my experience with Lucky Gunner. Ordering was easy, and shipping was extremely fast. 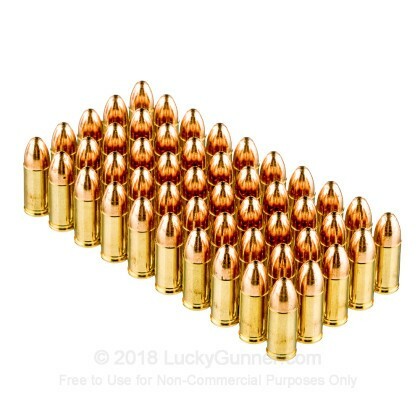 Would definitely recommend them to anyone who wants to buy bulk ammo. Will definitely order from them again. me a lot! Delivery was fast as always! I just went to the range and shot 200 rounds through my Glock 17, excellent groupings, very clean, one of the best ammo's I have used at the range. Buy it in bulk and enjoy! Been buying by the 500 lot, just picked up an order of 1000 since LG had them at a lower per price round than anyone else. My wife and I have put about 2000 rounds through our M&P 9 and M&P 9c between us: zero failures of any kind! Also burns clean and shoots just like the hollow point we load for self defense. We'll keep buying it as our first choice for range practice. Priced right and always shoots well. Glock 19 eats this stuff up. I enjoy shooting it, its reliable, its clean and its MADE IN THE USA. Federal American Eagles are great ammo for handgun shooting. I've shot thousands of rounds and never had a failure. Get to be able to 1,000 rounds at one shot, in one box, at a very reasonable price (considering the inflation in ammo prices over the last 18 months). LuckyGunner's website was great and they shipped fast. Overall, a great purchase for a very good company. Tried this ammo in my nano at the range and shot about 200 rounds without a single FTE. Have not been able to do that with other ammo. This ammo shows up at my door quickly, runs through my XDM without complaint, and lets me practice putting lead downrange accurately. What more can I ask? Product preformed well, no jams. This product is great for practice and training. No jams , accurate, and the online service and quick delivery can't be beat. Lucky Gunner is most definitely the place to buy and I will be a repeat customer. Heavier bullet was cheaper. Used to shooting 115gr. But this shoots well! Very pleased with the service and followup. Thank you for providing quick delivery and also the followup. from me again, keep in touch. R.M. Had been looking for bulk 9mm ammo for a few months and seemed to be striking out all over the place. Then found the Lucky Gunner and saw this option for 1000 rounds. Without hesitation, I placed my order. Shipping was fast and ammo arrived in a reliable sturdy unmarked cardboard box. I have a S&W M&P Shield 9mm. Shot 200 rounds so far - every round clean. No problems whatsoever. Really appreciate this site especially with all the stores having empty shelves. can't miss with AE 9mm ... been using this for 28 years and will continue ! Everything worked out great. I Like the ammo. Lucky Gunner rocks! Super fast shipping! No matter how many times I try, I never find anything as reliable as Federal. I've probably shot over 10,000 rounds of Federal in all calibers and never a problem. I shot in self defensive classes and for recreational. This ammo is perfect for both. I ordered 1000 rounds and it shipped the same day, and I got the ammo three days later to my front door! Best website and customer service I've found and will be back! I'd even pay more here than some of those "well known" big box stores where people fight over ammo. Not worth it. Repeat customer for LuckyGunner and American Eagle Ammunition. Great service and flawless product. I have been working to increase my pistol skills through private lessons that are fast paced with a lot of shooting time and needed to replace the stock to have plenty of rounds on hand to make it through the classes. Never a problem with American Eagle Ammunition and knowing that LuckyGunner will deliver the product quickly and on time helps to meet the 'just in time' needs for the classes. I have now bought 3000 rounds from Lucky Gunner. I have shoot this from my Sig 229 and a MP5 auto with no problem. I will be buying more soon. I've put about 600 rounds through my Glock 19 and am very happy with this ammo. It's slightly less clean than I expected but still much better than some of the other cheap stuff I've fired. Accuracy is good and no FTF or FTE. Lucky Gunner got it to me very fast, as expected. I've already shot a few boxes in a couple guns and no problems at all. I usually buy 1000 of the AE 124 gr. and 100 of the HST 124 gr. They go together very well and reliability is excellent. Excellent accuracy. ZERO misfeeds in the 1000 rounds fired. Clean. Federal, what more can you want. Great product; will purchase it again. As usual, Luckygunner delivers fast and secure. The product is good, no FTF, FTE or any other issue; this ammo will go down range accuratly, as long as you do your part. Fired 250 rounds on my new M&P Shield- sweeeeeet...... American Eagle is everything the video review says it is. LuckyGunner order processing was modern and easy like the popular retail sites Amazon. Delivery was fast and packaging was private. I was hesitant as a first time buy; going forward I can order with confidence. Need I say more? Thanks- I'll be back for more! Very happy with LuckyGunner and American Eagle Ammunition. I broke in a Ruger 22, CZ 75 Phantom and a Colt 1911 with ammo that I purchased from LukyGunner. I purchased 1000 rds for the 9mm and the 45 along with 2000 for the .22. I chose the American Eagle and have had excellent results. So far I have run 450 rds in the Colt, 500 in the CZ and have had no problems. The Ruger had been through a bunch of ammo, I have not kept up with how many rounds but I have only had 2 rounds not chamber. LuckyGunner had my ammo to me withing 2 working days. Very impressed with this company. I am certainly glad I came across their web page. It will be the only place I purchase ammo going forward. American Eagle was the brand we used at my concealed carry class, I am staying with this brand. I recently got my CZ P-07 and wanted to put it through its paces, thought I was getting some spotty range rounds to really test the gun, instead I was suprised to find these bad lads, 450 rounds down range and only one FTE (last mag and I limp wristed it). I was thouroughly impressed and will most definitely by these for plinking and range time! I have ordered this ammo twice. Have shot about 1,500 rounds in my Glock 17 and it has never missed a beat. Lucky Gunner always has the ammo to me in two days. How do you beat that? Great product and great service. I have shot American Eagle ammo in 38 Spec, .380, 40 S&W, 45ACP and now 9MM calibers and have had no problems of any kind with it. Having 1000 rounds delivered right to my door is icing on the cake. Good cleaner burning range ammo. I've used up half of the 1000 rounds already without any failures. Needed some range ammo. Wow, I couldn't believe how fast it arrived. I have shot a 1,000 rounds of this without any problems. I'll be ordering again soon.Thanks Lucky Gunner! American Eagle is one of my favorite 124 gr. 9mm cartridges. Its performance on the Range is near flawless. LuckyGunner is always a pleasure to work with. The delivery time is probably the fastest among the competition, and always pleases me. The cost for single boxes of ammo is a bit high - probably to give a gentle push to buying bulk. I would like to suggest that LuckyGunner offer 500 round bulk purchases (within a penny or two cost per round) in addition to the 1000 rd. bulk purchases. Doing that would be a help some months when the budget is a little thin. I do not think it would reduce sales for you - or shots for me. It would provide added Customer friendly flexibility. I ran low on ammo and had not been to the range in a while, I ordered on Sun and had it by Thurs. I have put down about 400 rounds down range, rapid fire, slow fire and have not had any problems at all. Thank you LuckyGunner! Great product and performance...and fast shipping to my door! I am through my first 500 with no issues in a Glock 19 Gen4. This is the first 124gr I have shot, and will order some more again. Awesome ammo! No FTF (failure to feed) or FTE (failure to eject) - no benched accuracy results. All close quarters work, and decently accurate for that application. Another fine choice from LuckyGunner! Very reliable & accurate ammo. Runs well in all my 9mm's. No problems to report. This is my second purchase of 1000 rounds. The price is great & always in stock. I'll be back for more. LuckyGunner ships SUPER FAST and the customer service is awesome. So far I have only shot 150 rounds, but no jams and shoots very accurately. The shipping was very fast. I will be ordering ammo for my 9 mm only from here! Great ammo, great service, great value! This Federal 124gr. FMJ ammo is a great value for target ammunition. It's less than half of what the ranges charge and still at least 20% cheaper than what I can find it for in bulk locally. 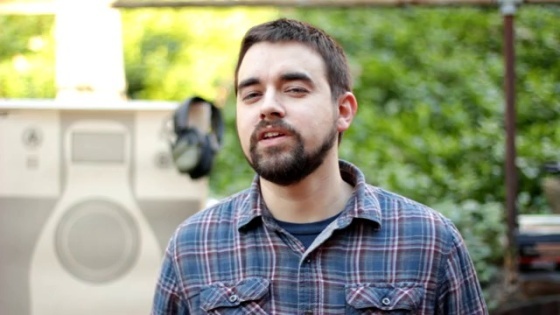 LuckuGunner ships fast, keeps you informed, and sends you exactly what you paid for. I wish all online buying was this easy. Will be buying from them again. Very good ammo, I shot the most accurate with it, and this ammo is relatively clean. Price is great on LuckyGunner, and the delivery was ultra fast, day after on the front door. Luckygunner.com will now be my sole source for ammunition! I purchased 1,000 rounds of 9mm 124gr American Eagle late one morning and it arrived at my doorstep the following afternoon (shipped FedEx Ground). I have scoured the web for better prices on quality ammunition, and if a site with better prices exist, I haven't found it. Not to mention that no one does better with shipping! If you have not already, I encourage you to place an order. You will not be disappointed. I thought I would try this in my Glock 17. Have shot 500 rounds with no issues. 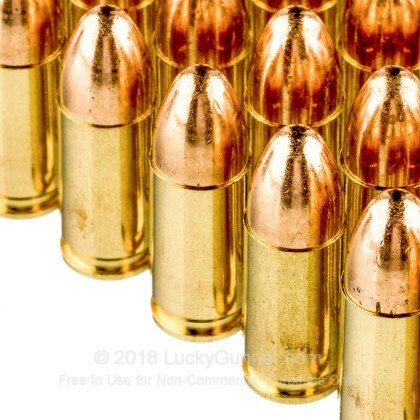 Really good ammo, at a really good price. Will order more soon. This was my first experience of purchasing ammo on the Internet and it could not have been simpler, easier or quicker. The order went into the system, was shipped as promised, and delivered to my front door. The ammo itself is exactly as expected and shoots accurately without jams. The Federal American Eagle ammo works great in my Glock 19. Very fast shipping from LuckyGunner. I shoot in Glock comps all the time and instruct new shooters I have found this ammo to be by far the best.It feeds well and have not had a jam in over five thousand rounds. It seems to group tighter then most other ammo maybe because it is 124 gram. Also good for self defense. The military uses 124 gr as well as other ammo. This is great range ammo. I ran through 500 without a hiccup. I would definitely purchase this again. Once again LuckyGunner is astounding with their turn around time. Great ammo at a good price. Ammo burns clean and is very reliable. So far out of 250 rounds I've had zero failure to fire issues and it's accurate too. Highly recommend! Bought case of 1000 rounds to use a range ammo. Shot 50 rounds so far through Beretta 92FS with no problems. Received my order in two days. Great price for quality ammo. Have put 100 of my 1000 rounds through my Glock 19 so far without any problems and don't expect any problems out of the next 900. I will definitely buy this ammo again and will buy it from LuckyGunner. Good product, shoots clean, good price, available in time for training. I was scheduled for enhanced pistol training and needed 1000 rounds for the class. I checked a lot of different sites and found the best deal with LuckyGunner. It was good to know that the ammo that I needed was in stock and that it would ship to me in time for the class. This is my second purchase and LuckyGunner has become my preferred company. I just ordered my fourth case of this ammo. I’ve put 3000 rounds through my CZ SP-01 Phantom, and XDM and not a single jam or misfire. American Eagle great ammo. Good range ammo for paper or plinking. No misfeeds on the XDM or FN after 200 rounds. Lucky Gunner has some fast shipping and good prices also. Try them out. You will see. I was shopping around the net and this place had the best price for the 9mm x1000. I would recommend to people to check back often because the prices do change. This is my first purchase with Lucky Gunner and the experience was positive; shipped same day as ordered and customer service is great. I will order from these guys again. Very fast delivery will a good price. I have shot 2 cases (2000 rounds) through my gen 3 glock 17 without a hiccup. Tough to beat for the price, quality and speed of service. Shot out of multiple 9's without any jams or misfires. Would recommend without hesitation. Good ammo. Worth the money. Recently purchased 1000 rounds of this Federal 124 grain ammo. I always buy Federal; it is my benchmark in every caliber I buy. It does have some bite on recoil. So, for competition range shooting, I will choose something else that has less Energy rating and thus less recoil to help with accuracy. Though it is Not bad round to practice with. Surprisingly, this ammo was leaving my gun really dirty even after 1-2 boxes (50-100 rounds). My shooting hand was covered with dirt. This ammo is cheap so it shows. But for the price, it is hard to beat. I will try now a case of low power Blazer. Top shelf range ammo at bottom shelf price. Placed my order on Sunday and received the ammo on Tuesday! This was the best price I could find anywhere for top notch range ammo. Shot about 500 rounds through my XDM and it has run flawlessly. Will be back to buy more soon. I use this ammo for all competition shooting, it's performace and reliability is consistant. The quality is the best I have ever seen both in and out of the military. Never had a issue with this ammo. I placed my order on a Thursday and my ammo was at my door on Friday afternoon. My Lucky Gunner experience was great. The ammo is reliable and it's clean. I will be placing my next order through Lucky Gunner very soon. All my ammo purchases will go through Lucky Gunner. With the cheap prices and same day shipping I have no reason to purcahse ammo from gun shops or big box stores. Great product. Functioned all weekend without one problem in all of my 9mm handguns. Performs flawlessly in my M&P. Highly recommend! I have shot thousands of rounds and this ammo and it has performed great. This is clean, accurate ammo at a fair price. The service is great and the shipping is extremely fast. My M&P loves this stuff, it just can't get enough. Will be getting more from Lucky Gunner. I love the fast shipping, got my ammo vary fast. I compared all the bulk ammo websites and Lucky Gunner has the cheapest ammo. Shot hundreds of rounds of AE with zero jams. Magtech ammo jams in my Beretta Nano every 5th round. Order was shipped the same day! Ordered on Monday morning and received my order on Wednesday! Ammo shoots great in my Glock 19. Way cheaper then buying at the range! Would recommend product / website to friends / family! Much better value then ammo purchasing at the range. Shot about 500 rounds through my Glock 17 without any problems. At 10M and 15M they performed flawlessly. Good buy, Good price and Good quality. I will be buying my ammo from Lucky Gunner from now on. Received the order in three days. This was my 8+ order from Lucky Gunner and as always what a great expereince. The 9mm shot great no FFF or FTF in 250rds. I have ordered this ammo before and have never had an issue, overall I have shot over 3000 rounds of this ammo. Keep it up LuckyGunner, the deals keep coming. I brought this ammunition with the hope that it would break in my CZ 75B. So far....it has to say the least. For some reason my CZ cycles it very well. Not only my CZ but my XD service seems to like it as well. I know I'm sounding a bit preachy; but my CZ seems to not like S&B brand at all. I plan on ordering more once I'm out which will be soon since I shoot 100-150 rounds every time I go shooting. I purchased 4,000 rounds about a month ago and since then I've shot around 1,500 rounds. Ammo performed flawlessly in my Glock 19 and HK P30. Clean, cheap and accurate. I'll be purchasing another batch here shortly. This was my first order from Lucky Gunner. Super fast shipment and arrived in only a 2 days! This has become my go to training ammo. Clean, accurate, and an excellent price. Thanks Lucky Gunner! I expected a few problems with very cheap ammo, but was pleasantly surprised to have none after 1000 rounds from my SP2022 Sig. I will be back to get reliable, cheap ammo soon. This ammunition works great in my CZ 75 SP-01 Phantom. I’ve used 800 of the 1000 rounds I ordered and not a single problem. Even with shipping it is better priced than local dealers and arrived at my doorstep within a couple days. I just ordered another 1000 rounds. Lucky Gunner is now my primary source of ammunition. I have used this ammo before, but can't find it this inexpensive locally. Even including the shipping! I did get a little frustrated with FedEx, but that's not a Lucky Gunner issue. Shipped quickly, reasonable price, exactly as advertised. Very satisfied. Lucky Gunner will remain my primary ammunition source. I have made several purchases from Lucky Gunner and have always been impressed at their great prices and super fast service. The American Eagle ammunition is made by Federal. I have started using more Federal ammo because it is quality ammunition sold at an affordable price. No FTFs or anything bad. Only have 100 rounds left of the 1000 I ordered! When I order from lucky gunner I usually receive my order the next day, its fast & easy.This is the first time I bought American Eagle, the 124 gr round is the best I have fired accurate every time. Great service by Luckygunner. Ammo arrived in two days. Ammo is what it is. Ammunition fires great through my CX4, not one jam, not one foul round. Brass is great for reload. This is where ill buy my next batch. I made my first purchase from Lucky Gunner buying a case of these. The service was top notch, the shipping was fast and the prices were great. I used this ammo hard at a tactical pistol training class with Tom Givens over the last two days. Not one failure. It went bang EVERY TIME and we were running our pistols a lot! Love it. This is my favorite range and match ammo. I was happy to see that Lucky Gunner had it in stock and for a good price. Will order again. Bought 1000 rounds since it was such a good deal. Shot 150 rounds through my Sig P250, not one failure. Great product at a great price! Who are these folks at luckygunner? I searched & searched for the best price online, and found it @ luckygunner. Place my order after lunch and the very next morning I have a twenty pound box at my desk at work!! You'd think they were down the street it was so fast. I bought a thousand rounds. It's great brass for reloading, always accurate, feeds perfectly, and is very affordable. Fired 250 rounds from my Sig 226 today, and had zero problems. Great ammo for the price! This is good range ammo at a very good price. But what's most impressive is this heavy box arriving at my doorstep in two days. How did LuckyGunner do that? They must be shipping courtesy Star Trek or Santa Clause! Amazing. This is the premier ammo site in my opinion. I have never had a feeding problem or failure to fire with this ammunition. I can also say the same for PMC. I like doing business with Lucky Gunner! The summary says it all. My Sig is finicky and ate this stuff up. When priced right this is my 9mm target ammo from now on. have already gone through 2000 rounds and not one problem. very good for the price. Good stuff. Great for plinking or for defense. A very good buy. Just purchased 500 rounds from lucky gunner for my new xdm 9mm. Fired every round accuractly, no hiccups, etc. Fast delivery to my door. Great value. Q: I live in CA and was looking at the list of FFLs that you ship to. Some of them look kind of “shady”. Once the ammo has been delivered to the store, what’s to stop one of these characters from just keeping it and not giving it to me? Seems to me if that happens, I’m out of luck. A: Thank you for yours question as it is a valid one. Let me ease your mind with an answer. FFL holders go through extensive background checks and all kinds of red tape in order to obtain an FFL. Most people that go through all of that, will most likely think twice before committing a felony. Also, should an issue arise, we would handle it here on our end. If you are truly worried, I would encourage you to either call them or visit their store ( if they have one) and just chat them up. You can get a feel for people's intentions when you see them or speak with them. Q: Is this brass reload able? A: Hello Dennis! I appreciate you reaching out to us about that! The Federal American Eagle ammunition is loaded in a brass case that is boxer primed so it can be reloaded. Federal brass is popular among reloaders for it's consistency and strength. We also have this 9mm - 124 Grain FMJ - Federal American Eagle - 50 Rounds ammo in stock in a smaller quantity.